Lifeline Theatre’s musical adaptation of Jon Klassen’s children’s book, We Found a Hat, shows a friendship put to the test. 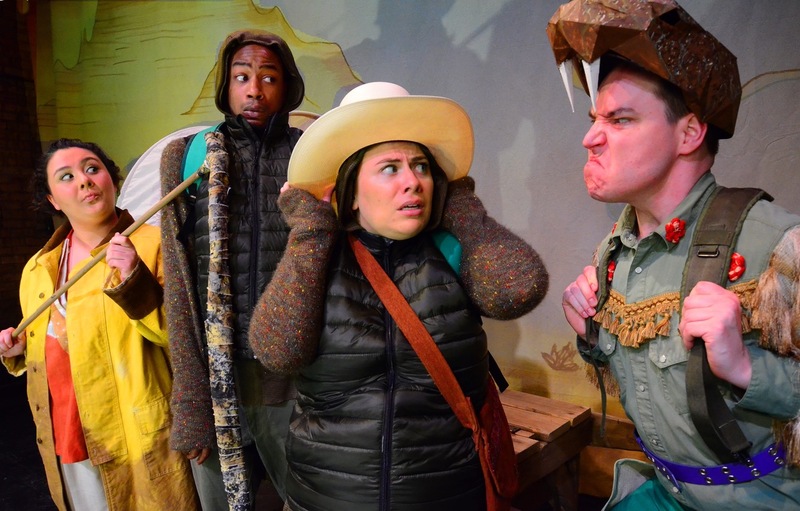 The play, adapted by Jessica Wright Buha and directed by Manny Tamayo follows two turtles, Sizi (Amanda Roeder) and Kai (Terry Bell), on a journey from their summer habitat to their winter burrow. To get there they must traverse a perilous desert. A meddling Cactus (Scott Sawa) makes a bet with the optimistic Sun (Gabriella Fernandez) that he can drive a wedge between these close friends. The setup has echoes of the devil betting God he can throw Job off his goodness game. The turtles unwittingly fall victim to this mean-spirited social experiment designed for The Cactus’s entertainment. The Cactus, personified as a menacing cowboy with a southern drawl and an excessively large hat, takes off said hat and leaves it in the path of the turtles, jumpstarting the conflict of the play. Structured like a classic road story, the turtles face a series of obstacles on their journey. Wearing the hat gives them newfound confidence and soon they start attributing their own successes to this seemingly magical hat. The turtles try a number of strategies that will be familiar to young children as they negotiate over the hat, which makes them both look amazing of course. These include taking turns with the hat, and having a finders keepers argument. As we would hope, they decide their friendship is more valuable than this exciting new piece of headwear. As always, at Lifeline the magic of theater is made accessible to young audiences through the simple and transparent art of make believe. The successful design in this production including Emma Cullimore costumes and Joe Schermoly’s scenic design is in keeping with this well-established aesthetic, although unfortunately the music in this show isn’t as memorable or successful as the music in other recent Lifeline shows. Like Klassen’s picture book, beloved by toddlers and preschoolers, this particular play will be most enjoyed by children in the under five age group. The show addresses problems that are relevant to their lives such as the difficulties of sharing and getting along with friends. The frustration of being very small and rather slow in a world full of obstacles (life as a turtle) mirrors the experience of life as a toddler. The experience of going to Lifeline, however, is always warm and welcoming. There are cosy blankets on every seat for kids to cuddle up with, and the cast signs autographs in the lobby for their adoring new fans. But perhaps the best kept secret about Lifeline is their Stories Come Alive Program. For $5 kids can do an hour long drop-in theater class at noon on certain show days, and parents are welcome to either stay, or take a little time to themselves (pro-tip the theater is a block from Roger’s Park’s beloved Heartland Cafe). As a parent who has been attending Lifeline loyally for years I’m excited to see the continuation of the company’s commitment to developing original children’s programming going strong under the new artistic leadership of Ilesa Duncan. Children’s theater fills a vital role in audience development that cannot be overstated. And I’m sure the fact my kindergartener recently insisted on signing up for musical theater after school has everything to do with the fact she’s attended the past three seasons at Lifeline. We Found a Hat runs through February 17th at Lifeline Theatre. CAST: Guest artists Terry Bell (Kai), Gabriella Fernandez (Sun/Moon/Ensemble), Amanda Roeder (Sizi), and Scott Sawa (Cactus/Snake/Ensemble). With understudies Anna Connelly, Sophia Foldvari, Maddie Pell, and Matthew Schnitker. PRODUCTION TEAM: Lifeline Theatre ensemble member Jessica Wright Buha (Adaptor & Co-Lyricist); with guest artists Emma Cullimore (Costume & Properties Designer), Derik Marcussen (Costume & Properties Design Assistant), Jennifer McClendon (Production Manager), Kate Reed (Stage Manager), John Szymanski (Composer & Co-Lyricist), Eric Backus (Sound Designer), Joe Schermoly (Scenic Designer & Technical Director), Manny Tamayo (Director), Eric Watkins (Lightning Designer), and Jonah White (Master Electrician/A.V. Supervisor), Suzanne Plunkett (Photos).